The Israeli military hit more than 50 terrorist targets in the Gaza Strip on Sunday, following Palestinian rocket fire at Israel's southern town of Sderot. Israeli commanders said the retaliatory strikes marked the greatest blow suffered by Hamas since Operation Protective Edge in 2014. The rocket fired from Gaza landed in a residential area, exploding next to a house and causing no damage or injuries. Police and Homefront Command forces cordoned off the area while sappers safely removed the projectile from the premises. "The IAF targeted terrorist infrastructure in response to projectile fire at the city of Sderot, which violated Israel's sovereignty and placed Israeli lives at risk. Hamas is the sovereign ruler of the Gaza Strip and it will be held responsible for any terrorist attack emanating from Gaza." an IDF statement said. The attack disrupted the Live Sderot music festival that had been taking place in the city. Mayor Alon Davidi consulted with police and military officials, and was granted permission to resume the festival, which saw some 5,000 visitors. Israelis gathered to celebrate. "We'll prove to anyone who wants to harm us and disrupt our lives that they can't do that," said one festival goer. "Naturally, we have some concerns over the rocket fire, but rocket or no rocket -- life has to go on." Last month we noted the predictable absence of any BBC coverage of the annual paramilitary summer camps organised by the terrorist groups Hamas and Palestinian Islamic Jihad for children and youth in the Gaza Strip. Now Palestinian Media Watch brings us news of another terror glorifying children’s summer camp. This one, however, did not take place in the Gaza Strip and was not run by Islamist terror groups. As long as the corporation continues to avoid reporting cases of blatant glorification of terrorism by the PA’s dominant party Fatah such as this summer camp, audiences will of course be unable to put that supposed Fatah ‘commitment’ to “peace and co-existence” into its appropriate context and the BBC will continue to fail to meet its purpose remit of building “understanding of international issues”. The Arab claimed village of Sussiya is illegal, that is a fact – got it? Take the case of the town of Sussiya, which has recently been making its way to the top of the news cycle around the globe. Sussiya is a small, ancient and historical Jewish community in the Southern Hebron Hills. But the interest isn’t actually on Jewish Sussiya, a thriving Jewish town today which archeological evidence indicates was originally a Jewish village established around 1,500 years ago. Instead the attention is being given to what some call “Arab Sussiya,” an illegal encampment built on state land adjacent to the Jewish historical site. The reason for the fuss is that following years of back-and-forth court hearings, with the High Court issuing an order calling to knock down the illegal structures on the site, the Civil Administration might finally carry out its duty. All that remains is the approval of Defense Minister Avigdor Liberman, who was asked to issue a ruling around August 15 in response to a petition drafted by the NGO Regavim to implement the demolition. Regavim has been monitoring the illegal building and expansion on state land taking place at Sussiya over the past several years and per the organization’s mandate is insisting the Civil Administration uphold the law and remove the squatters from land that is not theirs. While Regavim stands nearly on its own defending Israel’s state land, around 50 other NGOs have come forward to defend the land thieves. These anti-Israel NGOs both here and abroad are appealing to foreign entities including the US State Department to pressure Minister Liberman not to carry out the demolition of “Arab Sussiya.” These groups claim that the encampment is an ancient “historical” Palestinian village. To put it bluntly, that is a complete fabrication. Surveys of villages and populations conducted by the British Mandatory powers in 1945, which mention all of the villages in the area and even some of the inhabitants, prove there is no hint of the existence of an Arab village named Sussiya. More recently aerial photos from 1999 show nothing resembling a village in that area. An identical photo from 2013 shows how squatters have infiltrated the locale. Regavim research also shows that this clan of bandits is mainly from the Nawajah family who reside in the nearby town of Yatta. In 1986, using the ruse of being harmless shepherds in search of grazing land, members of the clan settled at the archeological site itself, but were evicted by the IDF. It was at that point that they moved to their current location. The Nawajah family has tried to take permanent control of the area ever since, in complete violation of the law. “But won’t the Arabs be left homeless,” if Israel were to destroy the structures? First, let’s remember that most of the trespassers are homeowners in Yatta. In other words, they can simply go home. But even so, out of humanitarian concerns and leniency, Israel agreed to allot an alternate area to the residents of the encampment, on state land adjacent to Yatta. The Arabs rejected this generous offer, proving it’s not about providing adequate housing and a future for their children, but all about illegal encroachment on Israeli lands in area C of Judea. A similar strategy of Arabs illegally squatting and building on state land in area C is currently being implemented in other parts of Judea and Samaria by the Palestinian Authority with backing and funding from the European Union, to the tune of hundreds of millions of euros. The goal is to illegally create a unilateral de-facto Palestinian state in area C and avoid any future peace talks with Israel. So while some anti-Israel Jews are getting together to support the thieves, let’s hope the defense minister makes the right decision to halt the illegal activity at Sussiya by taking down the illegal buildings, thus sending a message that in a democracy such as Israel, the established laws must be upheld. Who actually cares that foreign aid is diverted from needy Gazans to terror? Arnold Roth in his latest blog “This Ongoing War” discusses what can only be called “apathy” and even “irresponsibility” to the disclosures that tax payers money is beinig used for one of the most expensive projects in the world – the tunnels under Gaza. In a precised version of the blog, he further writes - "Yet the human rights organisations and the taxpayers around the world don’t seem to be expressing concern at the diversion of funds have caused. David Feith, of the Wall Street Journal reaffirms the depressing point ["Your Tax Dollars Fund Palestinian Terror", August 11, 2016] that none of this could happen but for the willful blindness of governments, foremost among them the United States. 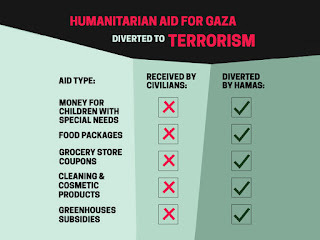 · Their Gaza operation should have been using an electronic funds transfer system with local banks that would have allowed the UNDP program to “be notified electronically when any bank transactions take place,” including, as the report delicately puts it, “transactions not made by UNDP.” But it didn't use it. Why? Good question. · Core procurement processes for ordering up “significant” civil construction activities that were supposed to be handled strictly by staffers - were not. Outsiders somehow got into the process. Why? Anyone's guess. The auditors called this a “critical” lapse and demanded “prompt action... to ensure that UNDP is not exposed to high risks. Failure to take action could result in major negative consequences for UNDP.” We will watch to see whether this fault gets mentioned in future media reports. · "The office’s internal financial tracking system — a UNDP-wide system known as Atlas — was improperly recording at least $8 million worth of civil construction spending at far less than its full value, a practice that UNDP auditors noted could keep the activity under the radar of higher-level U.N. officials who must approve purchase orders above defined cost threshold levels." Israel's concern for the well-being of the Gazans, suffering for years already under the jackboot of a kelptocratic Fatah regime and then, for the past nine years, under the ruthless Islamists of Hamas, may not be top of its list of concerns. But it's undoubtedly a concern. " I have spent a year working as a volunteer in a ward of a Hadassah hospital for cancer patients. It is place of desperation sometimes for the patients and their anxious families. And always, a place of dedication, by the hardworking staff. Because of the length of stay, a relationship builds between the staff and the patient and the family member who stays with them. Hope and joy, tears and suffering, are the daily emotions for all. The highly qualified staff work under stress, but with great compassion. I have memories that will stay with me always. Sad ones, like parents sitting helplessly besides their suffering children as their small bodies battle the cancer and the drugs. Happy ones like hugs all round and the sense of celebration when someone leaves completely cured. Lasting impressions will include meeting various nationalities such as Russian, Ukrainian, Siberian, Bolivian, Cypriot, Nigerian, British, American, Bulgarian, as well as Israeli Jews and Arabs, and Arabs from the Territories. People from all over the world who have come to Israel to take advantage of its advanced research and treatment. The media speaks of the ‘Arab Israeli conflict’. Blame is usually heaped on Israel and among the many biased and out of context accusations, the ugly word – apartheid is one. Let the accusers come with me and watch the working relationship between Jewish and Arab staff, and the equal treatment given to Arab patients. Let them observe the loving interaction between Jews and Arabs: a rabbi speaking words of comfort to a Bedouin mother; the group of Jewish young people singing fun Purim songs to Arab children as well as Jewish; a very orthodox man who plays his accordion for the patients telling me with delight how much pleasure it had given the little Arab boy whose illness had caused blindness; Jewish and Arab family members comforting each other. In my previous volunteer position of several years, I encountered the same equality of care and compassion given to Arabs from Israeli Aid organizations. I also learned about Jewish sponsored programs that encouraged cultural interaction between Jewish and Arab children and young people. In this special world of battling the formidable enemy called cancer, I see again the heart and intent of Israel that I have come to appreciate and which most of the world refuses to acknowledge.